Historia de la celebracian de la Eucarista-a, deteniandose a considerar la arquitectura, la masica, los libros y recipientes litargicos, asa- Como especificando la Teologa-a eucara-stica de cada momento: desde el siglo I (c. I), pasando por la apoca de la Iglesia domastica (c. II), su institucionalizacian con Constantino (c. III); la influencia germana en laliturgia (c. IV), el preludio de la Reforma protestante (c. V), la Reforma y la contra Reforma (c. VI), para concluir hasta nuestros da-as y buscando ofrecer una visian al maanana. Un libro accesible alaicos que ofrece una mirada ala riqueza de nuestra historia y practicas eucara-sticas, desde sus raa-ces juda-as hasta nuestros da-as. 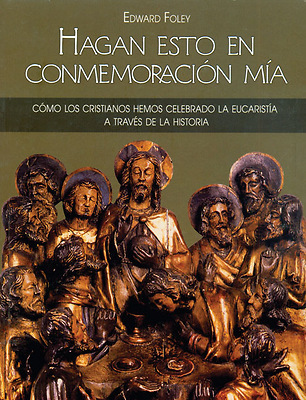 De gran utilidad Como libro de texto, incluso para nivel de postgrado, especialmente en cursos de Eucarista-a y un excelente complemento para Historia de la Iglesia.Explorala arquitectura, la masica, los libros y recipientes litargicos que contribuyeron ala expresian celebrativa de cada pera-odo. Apoyado en un salido marco contextual (lo que esta pasando en torno a).Ofrece al estudioso, al especialista o al aficionado una visian muy completa de la celebracian de la Eucarista-a. A travas de diferentes ejemplos visuales y auditivos, que son centrales parala Eucarista-a, los lectores descubriran de qua forma elculto cristiano es la expresian del culto que, alo largo de los siglos, glorifica a Dios y santifica a su pueblo. Nos ofrece tambian un acercamiento ala celebracian y culto de los cristianos reformados (protestantes), lo que es una novedad digna de hacerse notar. This book is written in Spanish only. Also avalale in English. Eucharist is the fullest expression of our life with God, alife we share with Christians throughout the ages. It is also a sensory experience, engaging us in the sights and sounds, tastes and touch of the worship. Edward Foley's revised and expanded From Age to Age draws readers into that sensory experience. He traces the development of ChristianEucharist from its Jewish roots to our own time. In addition to exploring the architecture, music, books, and vessels that contributed to each period's liturgical expressions, this edition introduces readers to the theology of each age as well as the historical and cultural contexts that shaped the Eucharist. Richly illustrated with numerous images and quotations from period texts, this book is a feast for the mind and eye. Through many examples of the visual and auditory symbols that are central to Eucharist, readers will discover how Christian worship is embodied worship that from age to age gives glory to God and sanctifies people. Edward Foley, Capuchin, PhD, is Professor of Liturgy and Music and founding Director of the Ecumenical Doctor of Ministry Program at Catholic Theological Union. A prolific author, he is coeditor of and contributor to A Commentary on the General Instruction of the Roman Missal (Liturgical Press, 2008) and coauthor of Mighty Stories, Dangerous Rituals: The Intersection of Worship and Pastoral Care (Jossey-Bass, 1998).